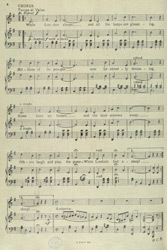 Many music hall songs appear to be social or political comments about society. This song for instance gives us a graphic account of poverty in 19th Century London. It contrasts the lifestyles of those who are well off and those who are homeless, or have to 'work the streets' to earn money. Sadly at the end of the song a baby dies of hypothermia. It is undecided whether songs like these actually stirred national consciousness, it seems that audiences accepted the situation and had no desire to attack or alter the class structure but were being 'entertained' using situations that they could understand.